The other day . . .: Ambition or Greed? The other day I read the interview of Divya Narendra. I came to know about Winklevoss twins, Facebook, ConnectU. I also read about the stress Divya Narendra made on the difference between ambition and greed. I could not fathom the difference between ambition and greed he had in his mind. But I found the puzzle challenging and decided to take it up with my method of explanation. To be frank it was not that easy to link the puzzle with the explanation. I mean, it did not click immediately. I had to think a lot, work with my models and then I came up with this explanation. First of all it is not wrong to walk along arrows. It is also not wrong to collect mangoes fallen on the way. These are guilt free activities and are assumed. 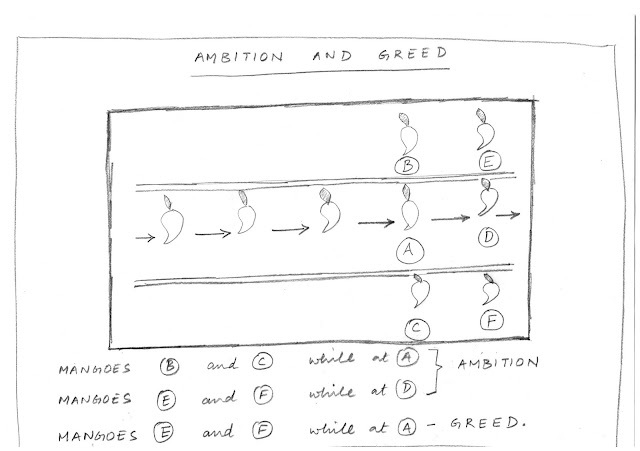 When you are in position A, if you collect mangoes at A, B and at C, then it is ambition. 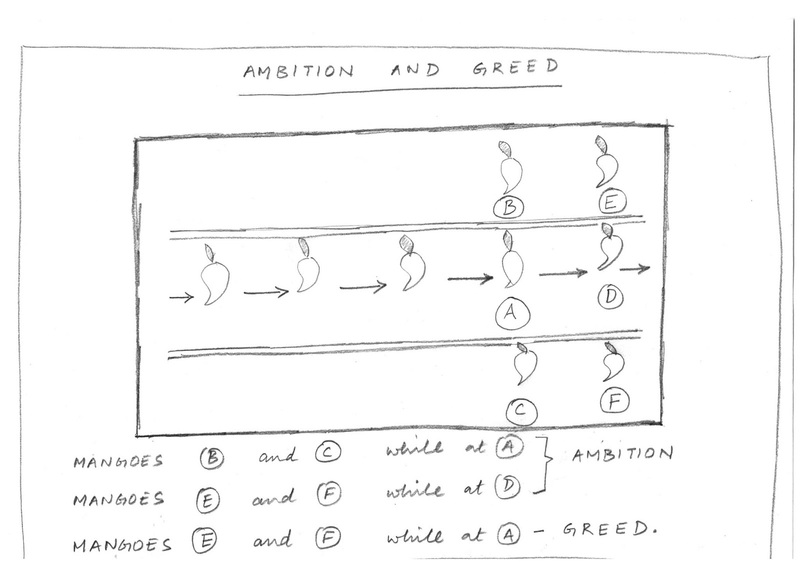 But if you are in position A, if you collect mangoes at A, E and at F, then it is greed. This is based on my Pythagoras law. A step from say, A to D is addition to what you walked till A. But Pythagoras says A to B is also addition and so is A to C.
Addition is also guilt free. And therefore my statement is that one may freely use Pythagoras ambitiously and collect mangoes at B and C while at A.
I now realize that the pattern that emerges is similar to a holy cross. Among the elements, Fire knows the best as to what to add.